We went along to see our SS12 sunglasses in action (round 2!) at Peter Jensen's 10 year retrospective show hosted by the V&A in its Raphael gallery. Showing a beautiful assortment of clothing and outfits from collections across the 10 years of his label, Jensen was able to create a montage of styles, piecing together an intriguingly complex story about his various female muses. The beautiful illustrated backdrop from his SS07 show by Charlotte Mann and props from other past collections, along with the Raphael cartoons, provided Jensen with the perfect setting to present a witty amalgamation of highlights from his past decade in fashion. Our frowning eyebrow Nina Simone inspired sunglasses on the catwalk...!! 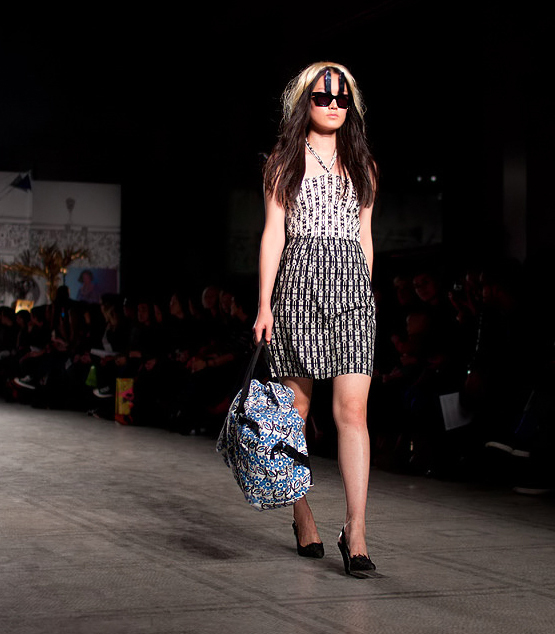 Our bunny ear sunglasses on the catwalk...!